Interests - Watching Disney DVDâ€™s, Doing Puzzles, Playing PC games and games on the Internet, Collecting Pin Badges, reading simple books under 100 pages - favourite authors are Roald Dahl and Jacqueline Wilson. Nicole was diagnosed with a Spinal Fibro Sarcoma tumour in Sept 03. She has had 4 months of intensive chemo and has almost completed 30 sessions of Radiotherapy. She is staying at Sam’s House, a CLIC funded property in Bristol. She hopes to return home when Radiotherapy has finished, to complete her chemo at Exeter. The biopsy of the tumour exposed her spinal cord and she has been paralysed from the waist down and we have been told that mobility is unlikely to return. Nicole is coping considerably well, and is an inspiration to us all. We are unsure of her long term prospects, but can only pray that she makes it through. Nicole is now moving on from Post Pals. It has been a privilege to be involved with Post Pals, and it has been a real help to Nicole and ourselves, to know that we have support from people all over the World! We would like to wish you continued success, and hope that you are able to cope with the demands that success has brought you! Nicole is well. We are waiting for a date for her 6 monthly MRI scan, which is due anytime now. She has an appointment with her spinal surgeon in Frenchay early in January next year. The girls enjoyed their summer holidays; we spent a week at Haven in Exmouth and a week at “Tom’s Retreat,” at Hoborne Naish nr. Christchurch. On our visit to Naish, Nicole got to meet two of her long term Post Pals, Liz Cook from Brighton, and Stuart & Liz Knight from Southampton! Liz came across from Brighton with her mum for a day out at Paultons Park, and also visited us at home in Torquay recently, staying for the weekend, which the girls really enjoyed! Lauren is now at school full time, and I have returned to work full time, hence the lack of updates! Nicole has been swimming with her school class and continues to learn the piano and enjoy Brownies. She has also started performing arts at school, and was a model on the catwalk at the school fashion show last week! In September, she got to go backstage at the McFly concert in Torquay, and meet all of the lads, get their autographs and some great photographs with them! The girls are getting very excited about Christmas, and I expect they will get far too many presents as usual! We would like to wish everyone at Post Pals a Happy Christmas, and a Happy, Healthy New Year. Nicole really enjoyed her 8th Birthday on 14th June and would like to thank everyone for their gifts and lovely cards. She had a party with her friends at the local theatre and watched Peter Pan on Ice. Her favourite present was Singstar for the PS2. She is becoming quite the Diva, and knocks out a great “In Your Eyes” by Kylie!! She has also recently been up to Dartmoor with her school and had a great time exploring the moors. She was the first child to stay at the Youth Hostel in a wheelchair. Her school carer went with her, but it was a big step in her independence to be away from home for 2 nights!! In May, Nicole completed the Cancer Research Race for Life in her wheelchair, with help from Mummy and “Team Coley.” Despite terrible weather conditions, she completed the race in 58 minutes and with matched funding from Barclays (Daddy’s Employer! ), they raised over £4,000!!! Thank you to everyone at Post Pals for your support and donations. Health wise Nicole is doing great and an MRI scan in April was all clear. She is also doing well at school and has a great group of friends that she has been close to since nursery. Nicole has had a quiet start to the year, but has a few exciting events lined up over the next few months. Today, she performed a piano recital in front of almost 100 people! She only started learning about 8 weeks ago, but her confidence has grown so much, she had no hesitation in getting up on stage and knocking out a few tunes on the Baby Grand Piano! In May, she will be competing in the Race for Life again in her wheelchair, and hopes to raise over £1,000 for Cancer Research UK. If you would like to support “Team Coley,” click on her homepage link above, and then on the orange “Donate Now” button. Barclays Bank will be doubling all donations received! You can also read a full update on Nicole’s progress this year. Nicole has just returned from a dream trip to Walt Disney World in Florida! It was her second visit, and this time she felt much stronger, and was able to go on many rides that she couldn’t go on 2 years ago, including some of the smaller roller coasters! Christmas flashed past, but thank you to everyone who took the time to send cards, many of them beautifully hand made, and especially to those who sent gifts including, Naomi Whittingham, Becki, Stuart & Liz, Hayley Thorn, Julie & Alan Barrett, Celia Raven & Co, and Nicole’s special Christmas Elf, Liz Cook!! Early in the New Year, Nicole & her sister Lauren went to see Kylie in her Showgirl Homecoming Tour at Wembley Arena, so it has been a busy but enjoyable couple of months! Daddy has done a full update on Nicole’s website, with photos of the Florida holiday. You can access it by clicking on the homepage link above. Happy New Year to you all and thank you for your continued support. It is quite an appropriate time to bring you all up to date, as it is almost 3 years to the day since the MRI scan that changed our lives forever, the MRI scan that diagnosed our 4 year old daughter with Cancer. It’s been 3 years of highs and lows, tears and laughter. Who would have believed at the time, that we would make it this far and Nicole would look as gorgeous as she does on the front cover of Cancer Research’s Christmas Catalogue!! We are so proud of her, and would encourage you to order a copy of the catalogue, by clicking on this link http://www.cancerresearchuk-mailorder.co.uk/catalogue_request It could become a collector’s item! Please place your order before Christmas, and help more children (and adults) like Nicole survive and prosper. The girls are back at school and nursery now, but we had a very busy summer break. Nanny and Auntie Tracy came down from Portland to visit for a week, and we all went to Haven Holiday Park in Weymouth for a week mid August. Nicole & Lauren had a great time at the Kids Clubs, and dancing away with Rory the Tiger, and Bradley Bear in the evening disco with party dances. We also went to Chickerell and Weymouth carnivals during the week, and the girls went on all the rides, enjoyed the Red Arrows display, and the carnival procession with all of the floats. Nicole wanted to catch up with a friend she made last year at nearby Littlesea Holiday Park in Weymouth, so we visited Hayley and her Mum, Dad and Brother Adam one afternoon. The big event in September was the South Devon Community Awards. You may remember that Nicole won her category as “Child in the Face of Adversity,” at last years awards. This year, we nominated her school carer, Barbara, in the categories of “Carer of the Year,” “Making a Difference in the Community,” and “Education Worker of the Year.” Barbara deals with all aspects of Nicole’s care, physical and emotional needs at school, and has been a big influence on her settling into mainstream school, and her positive outlook on life. Barbara has had a tough time over the last few years, but has always put others first. She worked in Care Homes when she was young, has worked with a number of special needs children, and has fostered over 25 children! Needless to say, we were absolutely delighted when she won the category of “Carer of the Year,” and you had to pick us all up off the floor, when she was announced as the overall winner on the night!! Nicole also got to go up on stage, as she presented this year’s child award to a lovely young lad called Liam, who suffers from Severe Eczema, and Cerebral Palsy. The evening went on until around 1.00am, and Nicole wore everybody out on the dance floor!! We have nominated Nicole for a Pride of Britain Award, organised by ITV, the Daily Mirror, and GMTV. She is in the “Children of Courage” category, and we nominated her for the bravery she has shown throughout her treatment and the way that she deals with her disability. She has also done a lot of fundraising and profile-raising this year, for Whizz Kidz, Cancer Research, CLIC Sargent and Postpals. A lovely lady called Ciara came down from Granada TV in London to visit Nicole a couple of weeks ago, and we are now waiting to hear if she was successful. All the nominees will be assessed by a celebratory panel, including Richard Branson, and if she is recognised by the awards, she will get to go to the awards ceremony in London on 6th November. It would be wonderful for her to receive such an accolade, so fingers crossed! Nicole is well and enjoying the last few weeks of school before the summer holidays. The MRI scan came back all clear, so we can relax now until November time when the next scan is due. She has just finished a 6 week course of Ranitidine. She was suffering from bad stomach pain, which was worrying us, but the medicine seems to have done the trick. It looks like it was just a bad case of indigestion, probably caused by sitting down for much of the day. Nicole has also been to Bristol for more botox injections in her legs, and also to see her spinal surgeon at Frenchay. He is happy with the rods in her back, and will x-ray her again in November when we go up for the MRI. Nicole’s 7th birthday was on the 14th June, and her party was on Friday 16th. Every birthday is now a landmark for us, and another step away from diagnosis and treatment. We remember celebrating her 5th birthday as if it would be her last, and pray that she will celebrate many more birthdays to come. Thank you also to everyone at Postpals who sent Nicole some lovely birthday presents and cards. In early June we went on Nicole’s Make a Wish trip to London and had a lovely time. Later in the month we visited Jamie’s Mum Kelly and her new baby Amy Grace. Amy was born on 14th June 2006, so shares Nicole’s birthday!! Thank you to everyone for all the lovely Easter cards and gifts for Nicole & Lauren, especially Liz Cook, Julie Barratt, Becky Butler and others! Nicole & Lauren now receive more post than Sara and I put together!! The Postman even knows where to leave the parcels when we are out! Nicole’s latest scan came back clear, which is fantastic news now that she is 2 years off active treatment! She enjoyed meeting Hi-5 after their concert in Torquay, and is looking forward to her Make A Wish trip to London at the end of May. We will be staying at the Hilton Hotel, and going to the Lion King Show, Rainforest Cafe, The London Eye, Madame Tussards, Hamleys, London Zoo, and anything else we can fit in!! Please see website for full update. For those of you in the South West of England, look out for Nicole on ITV West Country News on WEDS, THURS or FRIDAY night. It is likely to be on Friday, but may be earlier. We have just come back from Tesco in Ivybridge, where Nicole helped to launch Tesco’s new fundraising initiative with Whizz Kidz, who funded Nicole’s power chair. She had a star collecting race with another young lad called Joshua, and the press, TV and local MP were there! Nicole and I are also going to the local radio station, Gemini FM on Thursday morning, to see how the radio programmes are made, and there is a good possibility we may be interviewed on air!! Locals should tune in to 96.4FM, and I think you may be able to listen online at Gemini FM, and listen live to Chris Edgecombe (Edgey in the Morning). We should be there from around 7.30am until 9.00am, so set your alarm clock!! Thank you to everyone who sent cards, gifts and presents to Nicole and Lauren for Christmas. They were inundated every day and the playroom looked great with all the cards hung up! Special thanks to all of you who sent hand made cards, they really are very special and obviously took a lot of time and care to make. Nicole had a lovely letter with 4 cards from a school in Japan. Her class at school is hoping to do a project to send something back to them, as they have been studying Japan and its culture all term! Special thanks also to Nicole’s elves, Lorna Rogers and Liz Cook, who sent a big parcel each, full of lovely presents. Thanks also to Becki, Naomi, Jilly, Woody the dog and the Ravens for your gifts. Thank you so much! Nicole was well over Christmas and had a great time. She has returned to school and has received her powered wheelchair, so is able to get herself to school and back now, with daddy trying to keep up! She has been nominated and won a little star award from Cancer Research UK. She will be going to the Aladdin pantomime tomorrow to watch the show and receive her award from Syd Little and Craig from Big Brother! She is up at the spinal unit in Salisbury on 9th January to be measured for a back brace and will have her next MRI scan in May/June 2006. We wish everyone at Post Pals a happy and healthy new year! Keep up the good work; you are making a lot of children very happy. Thank you for your continued support, it means a lot to us. Firstly on the health front, we went to Bristol for an MRI scan and Botox injections a couple of weeks ago (10 Nov), and nothing has changed since the last scan in June. This is fantastic news, as Nicole is now 18 months off treatment, so we can relax now and enjoy Christmas. The next scan is likely to be in 6 months time. We are hoping to get the scans closer to home, at Exeter, or hopefully Torquay. Bristol is a long way to go for just a scan, and Nicole understandably gets worked up and upset when we go. I took her up on my own for the first time, and she was sick in the car. Luckily I had a cooler bag to hand just in time. A tricky manoeuvre when you are doing 70 on the motorway! On 13th November we went to Salisbury District Hospital (Odstock), where they have a specialist spinal unit. We have been trying to get to see them for some time now, as we want to ensure we are doing all we can to look after Nicole’s spine, now the Oncology is under control. We travelled up on the Sunday as it is a 3 hour drive, and stayed overnight. We were hoping for a nice comfy room for the night, but it turned out to be two rooms on a disused hospital ward! It was just as the cold snap started, and we had trouble trying to find staff on a Sunday to turn the heating on!! We spoke to Mr Tromans the Spinal Consultant, and the Physiotherapist, Occupational Therapist, and Orthotist. We covered some of the ground that we have already dealt with locally, but it was useful to know that much of what we are doing is correct. We are trying some new medication to try and control Nicole’s continence. She has started a new medicine called Oxybutinin which relaxes her bladder, with the aim of keeping her dry between her catheters. It has had a dramatic effect, and worked almost instantly. However, it has side effects of nausea, diarrhoea, and gives you a dry mouth. We kept these symptoms from Nicole initially, but within a couple of days, she was struggling to swallow her sandwiches, so we had to tell her. We have now reduced the dose, and that seems to have improved things. We now just need to try and control her bowel. Nicole takes Movicol to help things along, but there is no pattern. It could come at any time, and in any size, shape or form!! We have to keep a bowel diary for Salisbury, and they will then advise us how to move forward. They are talking about the possibility of enemas or suppositories! The Physiotherapist and Occupational Therapist were helpful, and have come up with some ideas for exercises and equipment in the home, and will liaise with our contacts locally to implement their plans. The Orthotist looked at Nicole’s leg callipers, hips and posture. We will go back up to Salisbury in January to see him, to see if Nicole’s new stretches are helping, and to cast her for a back brace. We are not keen on this idea, because it is likely to be uncomfortable for Nicole, but it is something they are keen to try, as she does tend to slouch over to one side in her wheelchair, and needs her hips to stay even, to prevent further scoliosis of the spine. They are also keen for Nicole to do as much standing as she can, as this will strengthen the bone density in her legs, and helps with bowel and bladder function. She has a wheeled standing frame, so will spend as much time in there as our busy schedule allows!! That’s it for health for the moment! We went to Prestwick in Scotland for half term, and stayed at Malcolm Sargent House, part of CLIC Sargent Cancer Care. And have been to lots of firework parties. It is 2 years since Nicole’s diagnosis! She is doing well and enjoying being back at school She has several trips to the hospital over the next few months for urology, a spinal unit and MRI in november/december. She is also currently being assessed for a powered wheelchair. Nicole has completed her disney princess stick book – thank you to everyone who has sent stickers. She has now started to collect pin badges, so if anyone is looking for an idea for a small gift/Christmas present, these would be very popular! Nicole has also enjoyed receiving many postcards from all over the country/world! We saw our spinal specialist in Bristol on Wednesday and he couldn’t believe how well Nicole was looking! He was the surgeon who pinned Nicole’s spine back together, when the biopsy went wrong in September 2003 and her spinal cord was exposed, causing her paralysis. He hadn’t seen Nicole for almost 12 months, and she has changed a lot since then! He told us that he honestly didn’t believe Nicole would still be with us, but was delighted that she had come so far. He had a good look at her spine without x-raying and said that it looked in good condition. The muscle and fat around her spinal injury is improving and filling in, because when the tumour fell out of her back, it left a big hole. The paralysis is still permanent, but she appears to be building up the strength in her trunk, which she will need in the future to transfer herself and get around on the floor. She has also had another botox injection in her legs, to help with her standing and stretching exercises. We saw Nicole’s Oncologist in Exeter today for the results of last weeks MRI scan and she has told us that there are no problems from her initial look at the pictures. She will have a better look next week, but the signs are good, which is great news!! She has indicated that the frequency of scans may now be reduced to every 4 or 5 months, which feels like another step in the right direction. 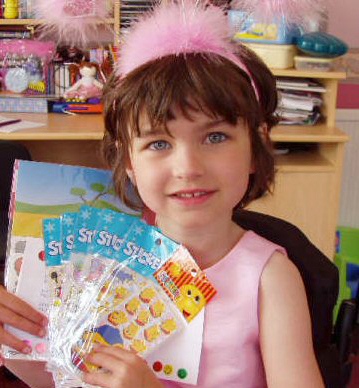 Just a quick thank you to everyone who has sent Nicole messages, cards and gifts for her 6th Birthday today. As usual, she has been inundated from Post Pals, and has had great fun this morning opening all of your presents, and beautiful home made cards. They really are very special. She had a great Fairy & Pirate party on Sunday with all of her school friends and we are having a family barbeque when she gets home from school this afternoon. We are keeping a close eye on the weather! We have loads to update you on, but as you know we have been busy with our trip to Eurodisney, Nicole’s Birthday and lots of routine appointments to Hospital. Nicole is feeling well and we will get the results of last weeks MRI scan on Thursday. I will attempt a full update within the week! Thanks to Sue for the regular cards for Nicole and Lauren, Liz Cook is still cheering up the guestbook! Nicole enjoyed the teddy tshirts (Posty Project) and the DVD from Stuart Knight. The first thing Nicole still says every afternoon when she gets home from school is “Have I got any post!”. We have just got back from 3 days in Eurodisney, and looking forward to Nicole’s birthday on the 14th. We have several trips to Bristol and Exeter hospital this month. It’s just over a week until the next scan on 3rd March. People often wonder how we feel when Nicole has to go to Bristol for her MRI. We found the following poem on another little girl’s website and would like to share it with you. We try to smooth the ups, the downs. Has the Cancer been killed; does it lie there in wait? Will it show up tomorrow, or some much later date? That we dwell in the past, trying to recall the way. It is difficult to put it into words how we really feel, but the words in this poem come pretty close. Every scan is a crossroads and we hope that our journey doesn’t take another twist or turn. Nicole and Lauren were inundated with cards and presents from Posters over Christmas- special thanks to her Elves- Nicky and Liz. In early December Nicole was an angel in her school play and did her family proud. She wasn’t too good over Christmas with colds, tonsillitis and then an infection over New Year, how ever last year Nicole was in the middle of her treatment up in Bristol so they were all just gland and grateful to be home over Christmas without lots of hospital trips. Scans show no tumour growth despite being off treatment for 7 months. They are going to delay the spinal surgery as there hasn’t been any dramatic change, and they want her as strong as possible. She played an angel in her school play. 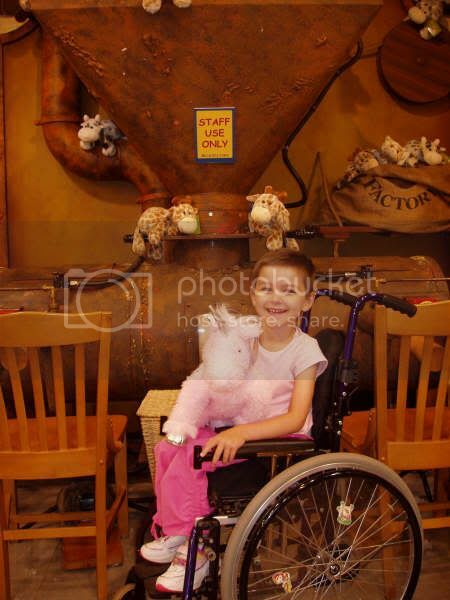 Nicole’s new wheelchair – complete with snakes on the wheels arrived in time for her wish trip to Florida. She met all the Disney characters and had a wonderful time, as did her whole family. Nicole is seeing the spinal specialist on the 29th of November, to discuss the possibility of full spinal rods and is having scans to check on the tumour on the 1st of December. Nicole has started to have botox injections into her legs. She is very much looking forward to her wish trip to Disney in November. Nicole should by now have moved into a more wheelchair friendly house, we hope it all went smoothly for them, but they won’t have internet access for another few weeks. She had several hospital appointments and her scans towards the end of August, the initial report is that there is little change in the size or activity of the tumour, which the family are seeing as good news. The spinal surgeon who put the original pins in her spine (when it collapsed during a biopsy of the tumour), was surprised at how far her back has now curved and is worried its at danger of folding forwards or sideways unless operated on. It was originally planned for this to take place in September, but they are now putting it off to the new year when he may have to pin the whole of the spine to stabilise it. She is also going to start a treatment of botox injections into various muscles in the hope it makes her more comfortable, they feel it is very unlikely she will walk again. After her scans, Nicole went on a trip around the bear factory (Post Pals had organised this), she got to choose 2 bear skins (one for her and one for Lauren her sister), kiss a little heart for each and have them made up for her and then pick out some clothes. She chose a pink sparkly unicorn (Kat also has one of these as they are adorable! ), with a swimming costume, sunglasses and hat, and for Lauren a bear in a bikini. Afterwards they went for ice cream at the Haagen Daaz Café. Thank you to the Bear Factory and Haagen Daaz for making this possible. Nicole is doing well and has broken up from school for the summer holidays. Nicole has a new wheelchair on order, it will be metallic blue with curly snakes on the spoke guards! We’ve had her school report which was very pleasing, she’s really doing well despite only being there for over half the days and we met her new teacher. Nicole went on another wheelchair course she learnt things like tipping the wheelchair to get up and down kerbs, crossing the road, and negotiating ramps. She has finally had the NG feeding tube removed (hurrah!). The main concern with Nicole at the moment is the stiffness in her legs. It is becoming more and more difficult to straighten them, making it hard to get her dressed and for her to sit on the floor comfortably as well as other implications. The family went away to visit family and spend quality time together getting up to all sorts! On top of this they are also looking at moving house. It is likely that they will move before school starts again. Post Pals have kindly arranged for Nicole and Lauren to visit the Bear Factory in Bristol whilst we are up there on 26 August, where they get to choose the skin of the teddy bear, kiss a little heart before it is put in the bear, see it made, and then take the bears home. This will be followed by a trip to Haagen Dazs Café for ice creams all round. I think I may get to eat too unless Nicole really surprises us!! Nicole is doing very well and is at school full time when she is not doing Physiotherapy, Hydrotherapy, wheelchair/standing frame assessments, or Hospital Clinics! She has made some good friends, they just seem to adapt so easily to Nicole’s disability. The other morning, several girls were skipping in the playground, something Nicole used to love to do. Seeing Nicole was left out, her friend Charley got Nicole to hold onto the ends of the skipping rope, whilst she wrapped the rope around her waist, and ran around the playground like a horse and cart! Her Birthday Party went superbly well! Nicole looked absolutely beautiful in her Blue Cinderella dress and tiara, and Lauren was quite cute as Piglet also. Around 34 children came to the party, which was a Disney themed fancy dress disco! We also had Elfic the Jester, who put on a fabulous one-hour show of juggling, plate spinning and unicycling, which kept the kids spellbound! Everybody then tucked into a MacDonald’s Happy Meal, with (appropriately) a Finding Nemo toy, to keep with the Disney Theme. Nicole is continuing to improve her eating, and has said she is hungry on several occasions. Something that we haven’t heard for a long time! She has had marmite sandwiches for the first time this year, and is also eating crisps and chocolate. During half term the family visited the penguins and seals at Living Coasts in Torquay, Nicole is enjoying school so much and couldn’t wait to get back after half term. On her birthday school friends joined us and we had a Disney themed fancy dress Disco with Happy Meals. May has been filled with going out and about, the family went to Prestwick in Ayrshire, Scotland for a week taking in all the sights of the area. Nicole had her first full week of school, which is a fantastic achievement so soon after treatment and she is loving it! Nicole had a friend round to play after school for the first time and went on a school trip to the Zoo. She had great fun playing with in the garden and she’s been going to birthday parties. We met with her Physio, and tried out some standing frames. She’s spent a few days in hospital with an infection following her Chemo. Nicole has finished Chemo and radiotherapy, unfortunately there is still a mass showing on her spine after the MRI and its unlikely she will be able to have any more treatment and surgery may not be an option. Nicole’s now allowed to recover from the chemo and will repeat the MRI in 2 months to see if the tumours still active. We got to spend 2 weeks at home. It has been the longest spell we have been together since last September! If she’s well enough she will go to school next week, she hasn’t been for a month. Over the Easter weekend Nicole took her new hand propelled trike to the seafront and pedalled all the way to the end of the pier and back. We’ve bought her a handheld DVD player some more Disney DVD’s to relieve the boredom on journeys to Bristol with a borrowed Gameboy. Treatment has continued at the hospital and Nicole went to school for a full day which was great. While we were in hospital she sees a teacher for an hour a day and we managed to get out and feed the ducks and go on the swings for the first time since September ‘03. We did the walk to raise funds for Nicole to go to Disney. In total, 210 children took part in the walk and probably just as many adults. We went into Exeter for Chemo, which took 3 days, with more scans scheduled for the end of March. We have also received many messages, cards and gifts from Postpals.co.uk, which always cheers Nicole up. Thank you to everyone for their support, it really makes a difference. Nicole has been in a pushchair since being paralysed and this has affected her independence. However, a few weeks ago, we discovered that Sam’s House had a wheelchair that had been donated for families to use. It turned out to be bright pink, Nicole’s favourite colour! As we are still waiting for our NHS wheelchair, the manager of Sam’s House has agreed that we can keep it until Nicole grows out of it. She has become very adept at using it, after only a few weeks. The chemo has affected her appetite and she has been losing weight since she came into Hospital. Because she has lost weight since being diagnosed she has had a nasogastric tube put in. Nicole started treatment at Bristol every day (Monday to Friday) for 6 weeks, with chemo at the weekends. The results of the MRI scan show that the tumour had not grown/spread. Over Christmas Nicole was discharged from hospital, but she had to go in for antibiotics on Christmas Day & Boxing Day. On New Years Eve 2003 Nicole has her first Radiotherapy treatment. Nicole started chemotherapy. We spent a couple of nights at the hospital and were then given a room at CLIC house, a home from home with 10 bedrooms near to the hospital. Nicole was transferred to Royal Devon and Exeter, much closer to home and it enables one of us to stay at home with Lauren. It also enables Nicole to spend some time at home between treatments and we are delighted when she was allowed home for the weekend of Lauren’s birthday on the 8th November. Nicole had MRI scan and we are told that the huge mass surrounding her spine is almost certainly a tumour. We will need to go to the Bristol Royal Children’s Hospital immediately. As there was still little response in Nicole’s legs and feet, another MRI scan showed a large blood clot where the tumour had been, which was pressing on her spinal cord. She had further surgery to drain the clot, and her spine was need to be pinned with 2 x 4 inch Titanium rods, screwed in with 8 screws. Nicole spent the next few days in Intensive Care. About half of the tumour still remained on the inside of her spinal column and she would have to start chemotherapy treatment, we were told that she had a Fibro Sarcoma tumour. It had not yet spread to any other organs and was not in her bone marrow. A Fibro Sarcoma is a very rare and aggressive tumour, usually found in adults, with 80f cases found in the knee. It is almost unheard of in infants. One night while getting Nicole ready for bed, we noticed a small lump on her back Our GP referred us to the Paediatric Consultant at the local hospital, he who felt that it was likely to be a fluid sac or fatty lump. Nicole carried on life as normal, enjoying the bouncy castle, skipping rope and hula-hoop, she had been given for her birthday. The results of an ultrasound scan of Nicole’s back but they were inconclusive.